The experiences of others is perhaps the most valuable of all the tools in the pastor’s “Ministry Toolbox”. For me, why else spend years upon years of attending ministry conferences in figuring out what others have done to make their experiences both faithful and successful. For small struggling churches perhaps the most important of all resources is in looking at what others, like yourselves, have done successfully. For example, if you are a small downtown church struggling with what to do with a large and expensive building, take a look at what others have done in similar situations in addressing this concern. 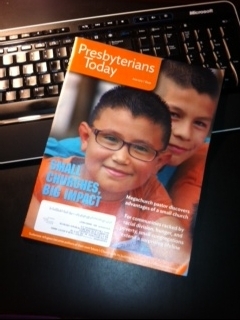 I just received my June 2015 copy of Presbyterians Today with the cover title. “Small Churches. Big Impact”. This issue is full of stories of experiences of others. This learning from the experience of others will help you open doors in trying new things in the future. In fact, I am writing this blog because I truly believe learning from the experience of others is for me the most valuable tool in my “Ministry Toolbox”.